FREE Clorox Scentiva Wipes At Price Chopper! 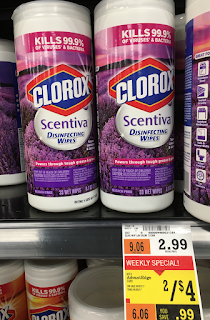 Save $0.75 On any ONE (1) Clorox Scentiva™ Wipe or Spray Item (Redeemable at Walmart) - on sale for $2 this week at Price Chopper = $0.50! Plus combine w/ $1/1 Hannaford comp q (says 1 per household) = 2 FREE!